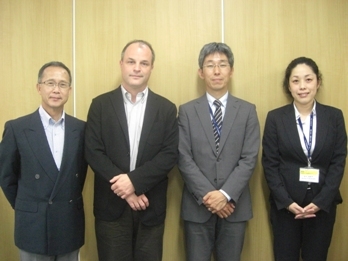 Mr. Stephen G. Kovacsics, Principal Officer, and Mr. Tamiki Mizuno, Political-Economic Specialist from US Consulate Nagoya visited the JICE Chubu Office on May 24, 2016. 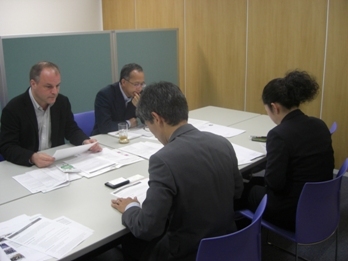 The two visitors were briefed on the overview of the US-related activitiesof JICE such as the “Training Course for Promoting Stable Employment of Foreign Residents” and the “KAKEHASHI Project”, a Japanese Government flagship international exchange project with North America by JICE Director Noriyuki Nakano and his staff. Mr. Kovacsics showed interest in the “KAKEHASHI Project” exchange program, in which Japanese youth visit the United States for a short stay to interact with American youth. He pointed out that such program will eventually broaden the views of Japanese youth on the world, not just his country. He also suggested that he may attend the opening or closing ceremony of the job readiness training course and help disseminate course information to more Americans living in Nagoya. Looking forward, we wish to continue our dialogue with US Consulate Nagoya. and Ms. Furukawa (right in the front row) at JICE Chubu Office.